According to research, approximately 80 percent of the population will experience acute back pain at least once in their lifetimes. The statistics unfortunately amount to tremendous financial burdens from the medical system as well as from the workforce in lost employee hours and loss of productivity. Two specific demographic groups experience the most extension related low back pain among the general population: the first group includes individuals who stand for prolonged periods of time, such as retailers, military, security guards, etc. Standing for extended periods of time normally forces the pelvis to begin shifting into an anterior tilt angle, placing compressive forces against the facet joints of the lumbar spine as these will also begin to shift towards a position of extension following the pelvic tilt; and the second group includes athletes who participate in extension sports, such as gymnastics, tennis, swimming, diving, football, volleyball, basketball, track and field, and cricket fast bowlers, and experience sports injuries. This may be more distinct in sports which include extension/rotation. 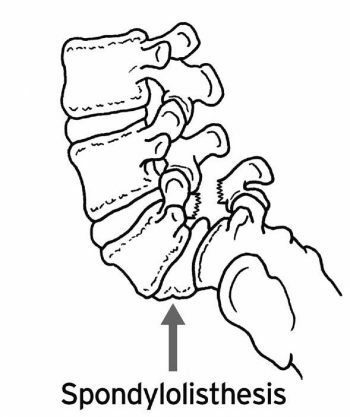 With normal extensions of the lower back, also referred to as backwards bending, the facet joints come close to each other and compress, a natural biomechanical movement. However, if the extension ranges are excessive, the movements will forcefully compress the structures, damaging the cartilage surfaces within the facet joints. Sports like gymnastics, tennis or football, may all involve excessive and uncontrolled extensions of the body. While unlikely, a bone stress response or a stress fracture could cause an isolated extension injury. Instead, sudden, forced extension injuries commonly damage pre-existing bone stress responses. In the same manner, if an individual stands for extended periods of time and the pelvis migrates into an anterior tilt, the facet joints are then placed under low load compression but for prolonged periods of time. With continued, uncontrolled loading, stress is then shifted from the facet joint to the bone beneath it. This will initially manifest as a stress reaction on the bone. The stress on the bone may then develop into a stress fracture if not properly corrected. This type of fracture is also referred to as a pars defect, or spondylolysis. Researchers believed that stress fractures were due to a congenital defect which occurred during an athlete’s teenage years. However, studies have now concluded that this type of issue most likely develops through years of overuse into extension positions, particularly among young athletes involved in the mentioned extension sports. Furthermore, one-sided pars defects tend to occur more commonly in sports that also involved a fundamental of rotation, such as tennis serving or fast bowling in cricket. Stress fractures generally also affect its opposite side, leading to bilateral stress fractures, where the stress is then transferred to the spinal disc in between the affected levels. The shift of one vertebrae over another is most commonly known as spondylolisthesis, ranging from mild to severe. Spondylolisthesis presents bilateral pars defects which may be the result of constant stress against the bilateral pars in extension sports. This is believed to be an independent pathology which develops in the early growth stages of an individual as this pathology is frequently diagnosed among the ages of 9 to 14 years of age. If they experience symptoms in later years as a result of participation in extension sports, the defects may have been present within the individual from a young age but manifested asymptomatically. As a result of quick growth spurts in teenagers and due to the increased amounts of training teenage athletes are involved in, there’s a possibility that a dormant variety of spondylolisthesis may present itself as an acute onset of extension related low back pain in the athlete’s later teenage years. 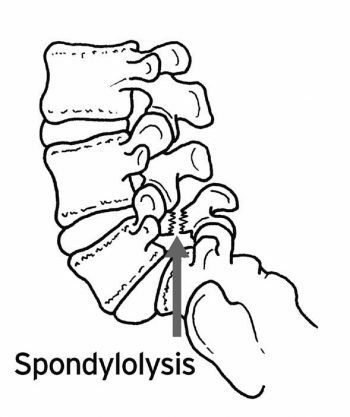 Spondylolisthesis is commonly found as L5 slips on the S1 vertebra of the spine and the condition can be graded according to its degree of slippage: grade 1, up to 25 percent; grade 2, from 25 to 50 percent; grade 3, from 50 to 75 percent; and grade 4; up to 75 percent and over. The progression of bone stress reactions tends to follow the following continuum: first, facet joint irritation occurs; second, a pars interarticularis stress response develops; third, stress fractures manifest to the pars; fourth, a pars defect, or spondylolysis develops; and last, congenital spondylolisthesis or as a result of activity, occurs due to participation in extension sports. 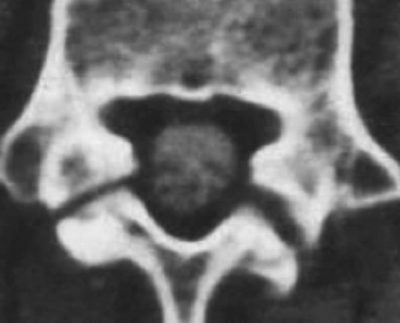 A landmark publication related to spondylolysis and spondylolisthesis was presented by Researchers and they classified these injuries as follows: type I: dysplastic, where congenital abnormalities of the L5 vertebra or the upper sacrum allow anterior displacement of L5 on the sacrum; type II: isthmic, a lesion which occurs in the pars interarticularis. 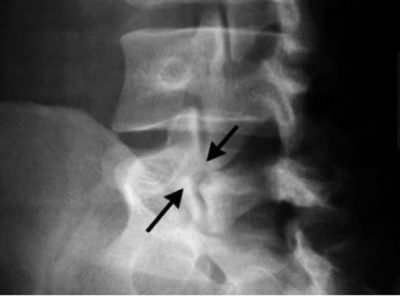 This can be sub-classified as lytic, representing a fatigue fracture of the pars, with elongated but intact pars, or as acute fractures; type III: degenerative, secondary to long-standing intersegmental instability with associated remodeling of the articular processes; type IV: traumatic, where acute fractures occur in the vertebral arch other than the pars; and type V: pathological, due to generalized or focal bone disease affecting the vertebral arch. The vast majority of spondylolysis and spondylolisthesis injuries are of the type II, isthmic variety. The above stages can be referred to as posterior arch bone stress injuries, or PABSI. Spondylolysis develops along the pars interarticularis of the lumbar spine. It’s most common at the level of the L5 vertebra, approximately occurring in 85 to 90 percent of cases. It has a high asymptomatic prevalence in the general population. However, particularly in young athletes but also in other athletes, it is a common cause of chronic extension related low back pain. In young athletes, the condition is often known as active spondylolysis. Active spondylolysis is common in almost every sport. Sports like gymnastics, diving and cricket, present a much higher risk of developing the condition due to the extension and rotation nature of these sports. From an active spondylolysis to a non-union type of spondylolisthesis, these have been linked to a higher incidence of lumbar disc degeneration. 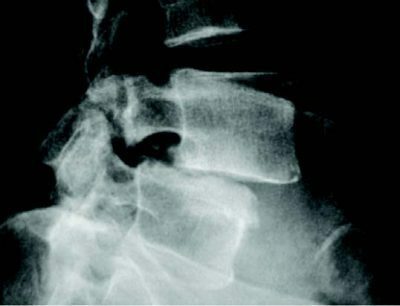 Through screening and imaging, early detection can help highlight the development of these conditions during the bone stress phase and, if it is detected and managed in time, the further complications can be avoided due to the healing capacity of the pars interarticularis in its early stages. Teenagers and young adults are more frequently diagnosed with PABSI, or posterior arch bone stress injuries as a result of the rapid growth of the spine through growth spurts, characterized by a delay in the motor control of the muscle system during this time. Furthermore, it is believed that the neural arch becomes stronger over time, explaining the low incidence of bone stress reactions in middle aged athletes. 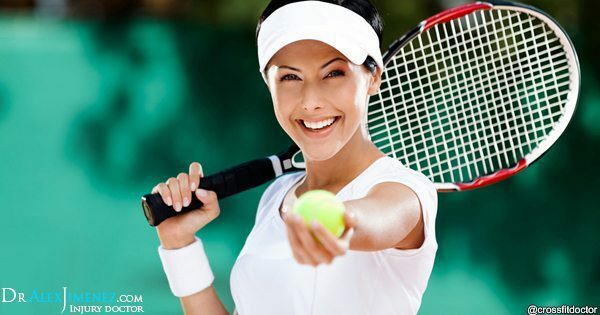 The well-known tennis serve actually creates excessive extension and rotation forces which may be a contributing factor for injury. Also, a forehand shot may produce high levels of rotation/extension. The more traditional forehand shot involves increased amounts of weight or load which then shifts through the legs into the torso and arms. A more favored forehand shot now involves facing the ball and generating the force of the shot using hip rotation and lumbar spine extension. This action does increase the speed of the ball but it places more extension and compressive loads on the spine, which can potentially lead to an increased degree of stress against the bones and other structures of the body. A golfing tee shot is believed to be one of the most probable component behind the development of injuries, as the follow-through of the shot involves a considerable amount of spine rotation with some degree of spine extension. Fast bowlers in cricket are the most susceptible to injury. Complications generally occur on the opposite side to the individual’s bowling arm. As the front foot engages on the plant phase, the pelvis suddenly stops moving while the spine and torso continue to move forward. When the particular bowling action rotation is combined with extension, this may place large forces on the posterior arch of the vertebrae. Over 50 percent of fast bowlers will experience a pars stress fracture, with young players being the most vulnerable. Cricket authorities have implemented training and competition guidelines to prevent these injuries by limiting the number of bowls in training or games. Because gymnastics and dancing involves a considerable amount of repetitive spine extension, especially backflips and arabesques, athletes who participate in these may be highly prone to suffer from injury as well. It has been suggested that almost all Olympic level gymnasts have experienced a pars defect. Certain limits have been developed, regarding how many hours young gymnasts can train to avoid the repetitive and constant loading of the spine. Through diving, spine extension injuries occur among athletes, primarily off the spring board and on water entry. As with contact sports such as the NFL, rugby and AFL, specific fundamental skill sets are required to execute spine extensions under load, resulting in injury. The more common field events to cause injury during field event include the high jump followed by the javelin throw. Both of these sports create enormous ranges of spine extension and under considerable load, these may commonly lead to injury. Posterior arch bone stress complications may manifest as asymptomatic injuries. Research indicates that these have been displayed among the general population without experiencing symptoms of back pain. However, many individuals usually report deep and usually unilateral, or one sided, symptoms of back pain. Additionally, the pain may radiate into the region of the buttocks. Extension movements or backward bending movements have demonstrated to aggravate symptoms of back pain due to posterior arch bone stress injuries, or PABSI. This is generally described as a gradual progression of pain or may be initiated by one acute episode of back pain from an extension movement. Upon clinical examination, individuals or athletes with PABSI report pain which may be obtained with a one-leg extension/rotation test, known as the Stork Test, which is conducted by standing on the leg of the affected side. In addition, the patient will experience tenderness over the site of the fracture as well as postural faults, such as excessive anterior tilt and/or pelvic asymmetry. The one-legged hyperextension test, best known as the Stork Test, has been suggested to be pathognomonic, or specifically characteristic, for active spondylolysis. A negative test was described to effectively exclude the diagnosis of a bone stress type injury, thus making radiological investigations unnecessary. However, researchers examined the connection between the one-legged hyperextension test and gold standard bone scintigraphy and MRI. They found that the Stork Test was neither sensitive nor specific for active spondylolysis. Moreover, it poorly predicted the presence of injury. Therefore, a negative test cannot exclude active spondylolysis as a possible cause and a high degree of suspicion for PABSI must be suspected in young athletes involved in extension sports which describe symptoms of extension related low back pain but are asymptomatic on the Stork test. Researchers suggest that the poor relationship between imaging and the one-legged test may be due to a variety of factors. The extension test would be expected to transfer a considerable amount of extension force onto the lower lumbar spine as well as placing significant pressure on the pars interarticularis, stressing other areas of the lumbar spine, such as the facet joints and the posterior lumbar discs. This may subsequently cause pain and the development of other disorders, such as facet joint arthropathy and lumbar disc disease. According to studies, grade 1 spondylolisthesis tends to be asymptomatic while grade 2 and other lesions tend to manifest alongside leg pain or without leg pain. On examination, a palpable slip may be apparent. Conventional radiology, a type of test which is not very sensitive but it is highly specific. Its restrictions are partially due to the direction of the pars defect. 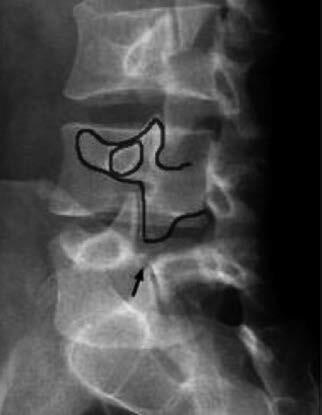 Spondylolisthesis can be viewed on a lateral film X-ray. If the plain film appears normal for spondylolysis, then a bone scan, or SPECT, may be required. Planar bone scintigraphy, or PBS, is highly sensitive but not very specific. Single photon emission computed tomography, or SPECT, improves sensitivity as well as specificity of PBS than simple radiographic studies. Correlating studies between PBS and conventional radiology have demonstrated that scintigraphy is more sensitive. Individuals with positive SPECT scans should follow up with a reverse gantry CT scan to assess if the lesion is active or old. 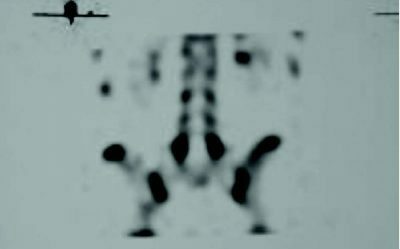 Computed tomography, or CT, scans are considered to be more sensitive than conventional radiology and are believed to have a greater specificity than SPECT. Regardless of the type of cross-sectional image utilized, CT scans provide information on the condition of the defect, such as an acute fracture, unconsolidated defect with geodes and sclerosis, pars in process of consolidation or repair. The reverse gantry view can evaluate this condition better. Repeated CT scans can be utilized to monitor the progress and healing of a pars defect. Magnetic resonance imaging, or MRI, is a technique which demonstrates distinct changes in the signal at the level of the pars. This is identified as stress reaction and can be categorized into five different degrees of activity. MRI can be useful for evaluating components that stabilize isthmic lesions, such as intervertebral disc, common anterior ligament, and associated lesions. The MRI, or magnetic resonance imaging, is not as specific or sensitive as SPECT and CT combination. Therefore, the current gold standards of analysis for athletes with extension related low back pain are: bone scintigraphy with single photon emission computed tomography, or SPECT, if positive; and limited reverse-gantry axial computed tomography. There are various restrictions to utilizing the previously mentioned modalities to diagnose injuries, including the intravenous injection of radioactive tracer and the young athlete’s exposure to ionizing radiation. MRI has many advantages above bone scintigraphy, pertaining to the non-invasive nature of the imaging and the absence of ionizing radiation. MRI changes in active spondylolysis involve bone marrow edema and fracture. 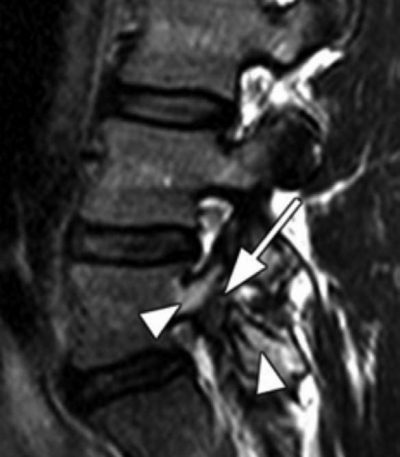 Although, it is much more difficult to detect the alterations of active spondylolysis with MRI. Detecting pathologies through MRI depends on the perception of contrasting differences of signals when compared with normal tissue. Moreover, for active spondylolysis, this interpretation involves a small are of bone along the pars interarticularis, which is surrounded by many other structures. Apart from stress fractures in other regions of the body, the small area of the pars interarticularis could make the detection of these alterations more difficult. Computed tomography has the ability to differentiate between acute and chronic fractures and this differentiation may be an essential determinant to heal fractures. Although MRI may be equivalent to computed tomography in detecting fractures, its inability to determine fracture age reduces its usefulness. Accordingly, in subjects with pars interarticularis fractures detected by MRI, it may still be necessary to perform thin computed tomography slices to determine whether a fracture is acute or chronic, a crucial element in fracture resolution. 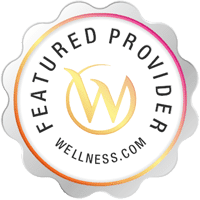 After an athlete has determined the source of their extension related low back pain, there are several treatments available for them to find relief from their symptoms. Chiropractic care is one of the most popular alternative treatment options available to alleviate spinal complications. After careful diagnosis of the root cause of an individual’s symptoms, a chiropractor will generally utilize a series of spinal adjustments and manual manipulations to correct any misalignments of the spine, or subluxations, helping to eliminate the irritation or inflammation of the structures surrounding the affected region of the spine, ultimately reducing or eliminating the individual’s painful symptoms. Additionally, a chiropractor may recommend a series of stretches and exercises according to the individual’s severity of injury, to speed up the rehabilitation process as well as increase the individual’s strength, flexibility and mobility. Chiropractic care is an effective, alternative treatment option for many types of injuries or conditions, primarily focusing on those surrounding the spine, to help restore an athlete’s original health after experiencing complications which manifest as extension related low back pain.